Do you wish you had some extra support to live your healthiest life? Today’s giveaway is sponsored by HueTrition – where you can get nutritional advice, healthy living tips, delicious and nutritious recipes, helpful free videos and oh so much more. With HueTrition, you can get personalized advice from a nutrition expert all from the comfort of your own home. It’s extremely affordable with a HueTrition subscription! For nutrition tips and more, like this video on How to Lose Weight Forever: Easy Tip – Relationship with Food, you can even subscribe to their YouTube channel (or shall we say, HueTube). HueTrition.live is an easy, cost-effective way to get all the nutritional advice, encouragement, tips and recipes you need to support you to be healthier all year long – but what is it? HueTrition Live is an amazing platform: Where Health & Wellness Meets Technology – The New Gateway to Food as Medicine & Preventative Health Destination. It’s an online space where you can contact experts, attend health & wellness support groups, see healthy culinary events with their Chefs, take online classes & reach your goals all in one. Infographic brochure for your fridge or office detailing the benefits of each color of fruits and veggies! Access topics in health with real-time video. HueApproved food and health product reviews. SPECIAL OFFER: Get a consultation with the HueTrition founder with this awesome starter pack – GO HERE. Make sure to check out what events are happening next, and watch a few (or all) informative and engaging videos on HueTube. You have so much to gain and nothing to lose. Enter now for the gift card and don’t forget to subscribe to the HueTube Channel for advice about nutrition from the experts. 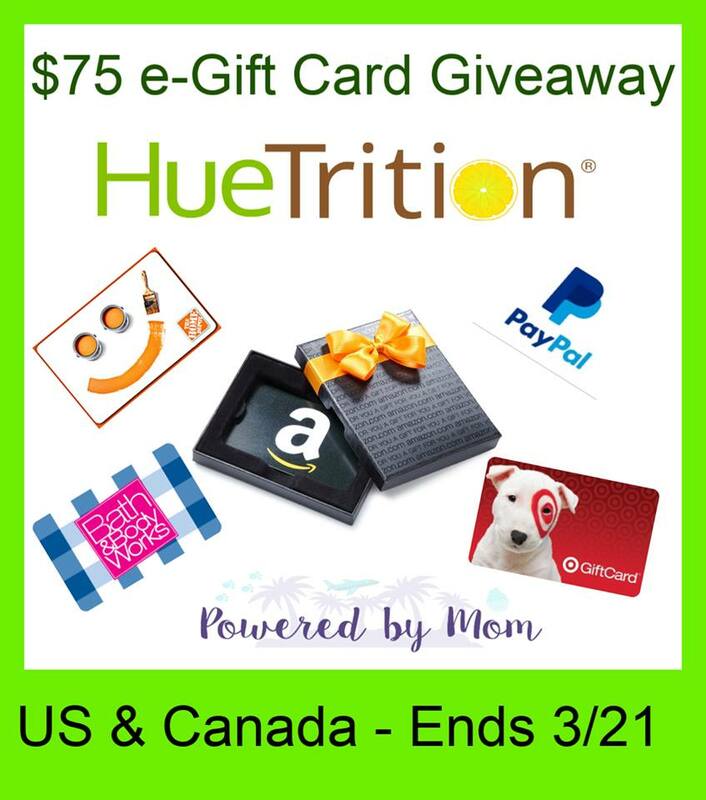 Winner will receive a $75 e-gift card of choice or Paypal courtesy of HueTrition. Gift card must be available as an e-card. I like that HueTrition offers access to experts, health & wellness support groups, healthy culinary events with actual Chefs, and online classes & reach your goals all in one! I love that they offer access to experts and online classes. I will love to try to fit this into my budget! HueTrition seems highly recommended.